Planning your new kitchen and want something different? Tailored Artworks ‘Real Art Kitchen Splashbacks’ are custom designed with you to create a unique and relevant conversation piece. It’s art inspired by you and your kitchen! 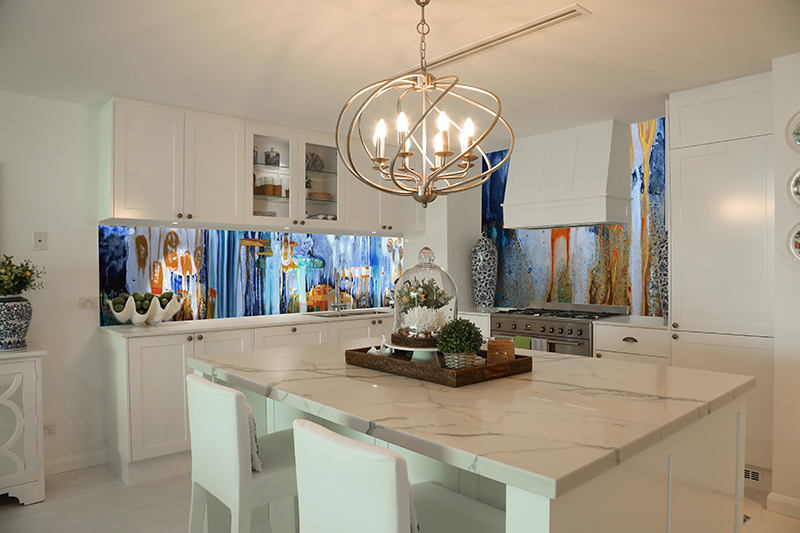 Whether a new build or renovation, Real Art Kitchen Splashbacks are custom designed with you to create a unique and relevant conversation piece. Imagine art combining real metallic textures and shine: iron and rust, bronze and verdigris, copper and patina, gold and silver effect paints, glimmering 18-23 carat leaf or glamourous iridescent light effects for your kitchen’s defining statement. You can have dramatic art in charcoals’ neutral tones and textures easily refreshed with new accessories! Lightfast, heat, water, mould, mildew, dust and pest resistant, your handpainted Real Art Kitchen Splashback by Sharron Tancred will unite your kitchen finishes, add value to your home and create your ultimate style statement! Splashbacks under 200mm from the closest gas burner require 5mm toughened lo-iron Glass. Our recommended installer can help you or we supply HIA | QBCC Standards checked instructions for your installer of choice! For Electric Hotplates less than 200mm away, please refer to the manufacturer’s installation specifications. Splashback artworks are accurately quoted on thumbnail design long distance or at Planning Session. Call us for artwork, glass and installation estimates. Artworks shown are serving suggestions from Tailored Artworks. Kitchen photos on this page are by Craftbuilt Kitchens. 1. Design- make it relevant to you! We design according to your taste and the rules of interior design and quote your artwork and any glass estimates. If you are happy, pay 50% deposit and book our recommended / your installer. 3-6M splashbacks use 2 boards | 6-9M use 3 boards | 9-12M use 4 boards. 3. Choosing board thickness and safety requirements: If combustible wall and nearest gas burner perimeter. Is under 200ml, glass is required. Plan for 14.5mm total thickness: tape and purchase 6mm thick board x min 150mm high, silicon, use 5-6mm thick glass Read More. Up until installation, your Real Art Kitchen Splashback is guaranteed to match your décor and be loved, or we will amend it at no extra charge to you. According to the Housing Industry Association (HIA), this far exceeds what is legally required. 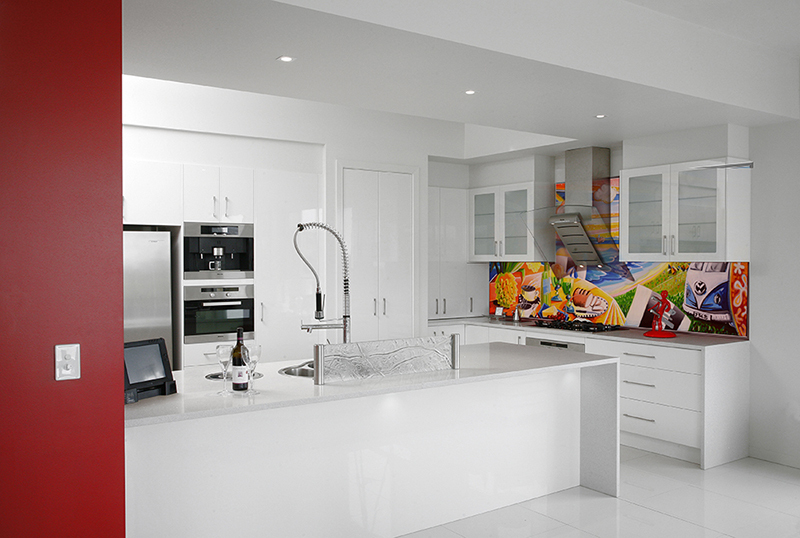 Tailored Artworks Real Art Kitchen Splashbacks are HIA and QBCC (Queensland, Australia) Legislative Compliance Approved. Our instructions are a guide only with final details to be determined by your contractor or our preferred installer according to your kitchen’s structure. Jobs exceeding $3300 (including art) require your installer to purchase Warranty Insurance with QBCC which covers anything untoward. All Tailored Artworks paints and special effects are heat resistant up to 80 Degrees Celsius and are UV lightfast. 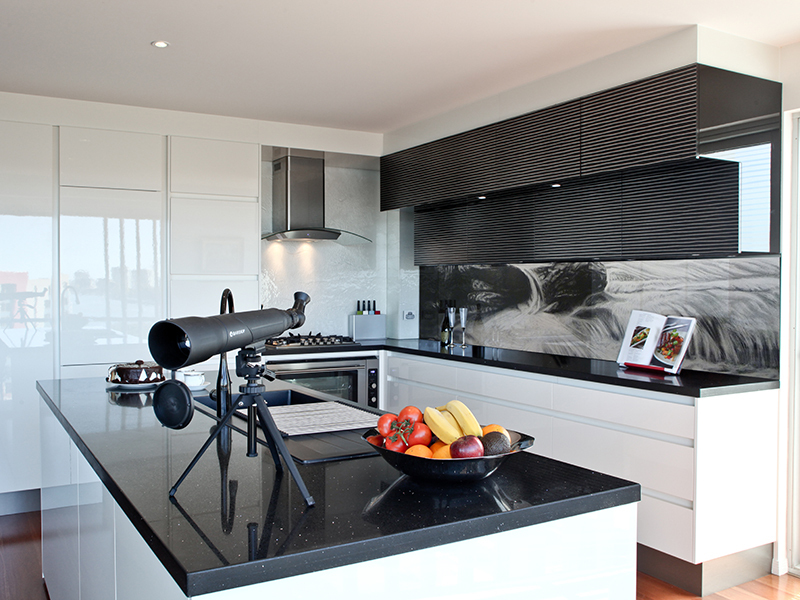 Tailored Artworks Real Art Kitchen Splashbacks have taken months of research, technical checking and planning. Not all processes are outlined here to protect our intellectual property. All copyrights reserved (C) 2017. Book your 2 hr Art and Décor Planning Session today with Sharron Tancred! STAND OUT FROM THE CROWD WITH MOSAIC! Tailored Artworks’ new Art Into Mosaic product creates a stunning all-weather feature for your home or corporate space. Brilliantly coloured, high-gloss mosaic tiles add texture and spark to your indoor or outdoor space—never fading, cracking or wearing. This is real mosaic, not printed! Every mosaic is uniquely tailored to your taste and space. Just show us your project, and we will send you our artwork suggestions based on our existing library. The artwork is later digitised as perfect rows of gorgeous mosaic tiles, delivered boxed and numbered, ready for easy DIY or professional installation by your preferred tiler. Art into Mosaic creates a stunning, but practical and easy to maintain conversation piece that everyone will envy! With a huge range of 58 plain and numerous metallic colours, mosaics are ideal for bars, feature walls, letter boxes, tabletops, fountains, around retaining walls, and kitchen and laundry splashbacks. Mosaic is also suitable for pools, as the mosaic tiles can sustain chemical cleaning and scrubbing. Simply apply an anti-slip treatment for wet areas!